I've had an issue for some time now with the front end of my car wearing the outsides of the tires. I've had it aligned twice in the last two years, yet the wearing is getting worse. 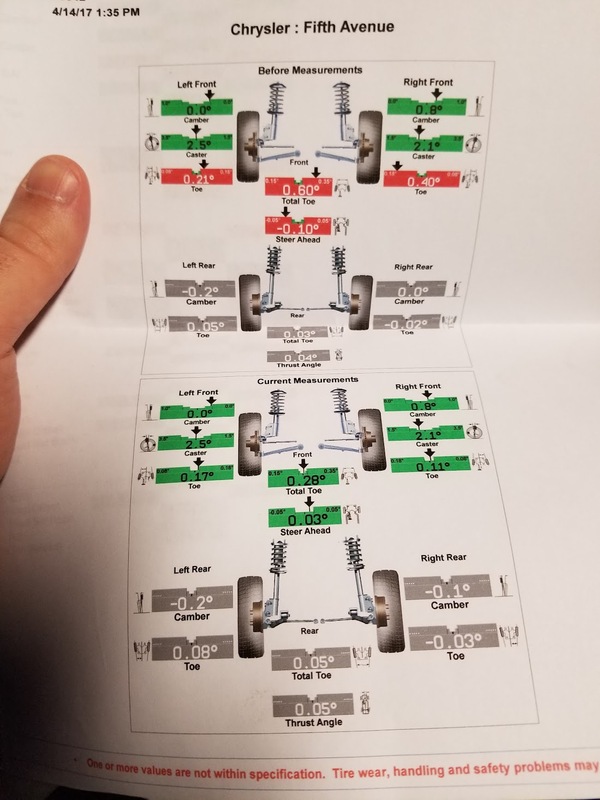 From the printout I got comparing the two previous years camber and caster have stayed the same, so I think it's more a less a problem of not being aligned to a spec that doesn't cause tire wear. Problem is, I have no idea what values to ask for and it's obvious whatever factory spec is it isn't working. Last edited by MarkM; 02/24/18 09:35 PM. I think for one thing, since camber/caster are exactly the same, the shopmonkey didn't touch anything but the tie rods on the second "alignment". Then, camber should be slightly negative. Certainly not positive, that's for old cars running diagonal tires. I would also be looking at worn/soft bushings like idler arm, strut rods or in the upper/lower control arms. After you check for worn parts find a race shop to do the alignment. You will pay more but they will and set it correctly. 2003 Dodge Dakota R/T "DEAD"
What do the printouts show? Sorry, for some reason the image of the printout didn't embed properly in the original message - I just fixed it. All the parts on the front end are new. Moog bushings/joints/tie rods & sleeves/etc. Firm Feel T bars, and Firm Feel upper control arms. It was a race shop that both alignments. Idler arm good? No slop in the torsion bar bushings? I'd question the equipment was installed on the car properly. It doesn't take much toe to burn off rubber. It sure seems like a "Toe and Go" alignment. Very few newer cars have camber and caster adjustments. .28 degrees total toe on a 25.5" diameter tire is 1/8" toe. you can easily gain positive caster and negative camber, if there is inward adjustments on the rear cam eccentrics on BOTH sides of the car. FYI .075 deg total toe on a 25.5" tire is 1/16" toe in. Excessive Toe-in is causing the outside edges to wear, not the Camber nor Caster. That .6 degrees is WAY OUT, nearly 2x. .28 degrees total Toe-in is perfectly fine now but what was the Toe in the previous years alignments? Last edited by myduster360; 02/25/18 04:11 PM. I'd agree with the previous replies on toe. The fact that they are a "race" shop and didn't suggest better specs to you would make my suspicious of them. If they are giving you free or low cost adjustments to get it back where it should be, then you might stick with them, otherwise, I'd look for a new place. Ditch the 5th Avenue specs for '05 Mustang GT specs. I see .4 more positive caster on left side. Ok that may be for road crown. But why not then run .8 negative camber on left side to equal things up? Is the .8 negative camber on right side also for road crown? Is the tire pictured above the left front? It sure seems like a "Toe and Go" alignment. Mark, That's what you're looking at there. They only adjusted the toe. Sorry but thats what happened. That camber is out of spec even for the original bias & cross ply tires. eg from 1968 Plymouth Service Manual. With modern radial tires - especially performance tires - they will want some negative camber. (Competition tires all have recommend range you can get from the manufacturer.) 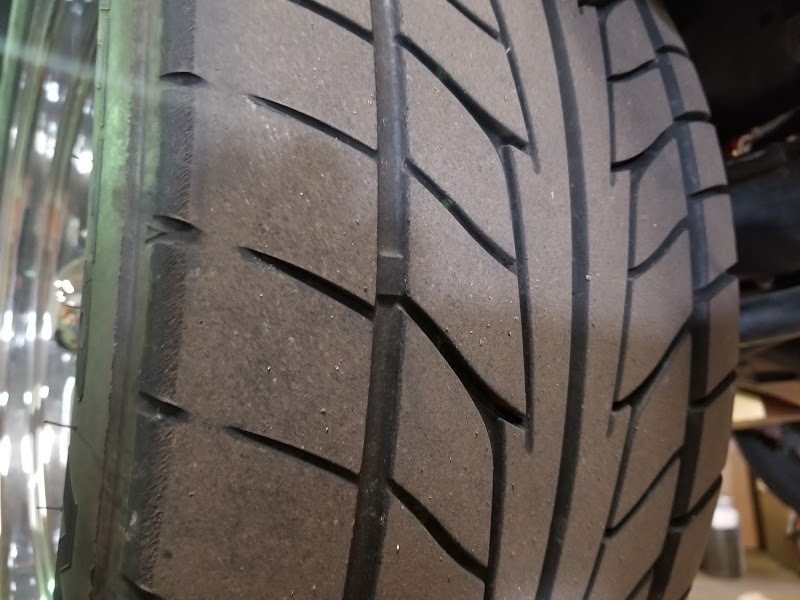 If you have nothing else to go by, based on tire wear with +.8 on the one side, and assuming radial construction, go for -.5 camber both sides as a starting point. Alignment changes must be done in sequence. The factory service manuals lay this out very well. This reduces the number of iterations to get everything in spec. Last edited by Mattax; 02/25/18 04:41 PM. I didn't notice it had POSITIVE .8 degrees of camber. That BS. Have them fix that at the very least. Last edited by autoxcuda; 02/25/18 09:46 PM. I think the shop was lazy and their system isn't working with correct numbers. No way is that .8 positive camber on the right front "in spec"
I would go back and demand .5 Negative. Toe looks OK. Agree it needs negative camber, especially with radials. Positive camber will wear the outsides. You need between .5 and .75 degree negative camber and as much positive caster as you can get up to 5 degrees. Also, you really need to tell the shop what you want. A good and friendly shop will try to dial it in as requested. At least that is my experience. Otherwise, most do not know what to do with a classic T bar car.